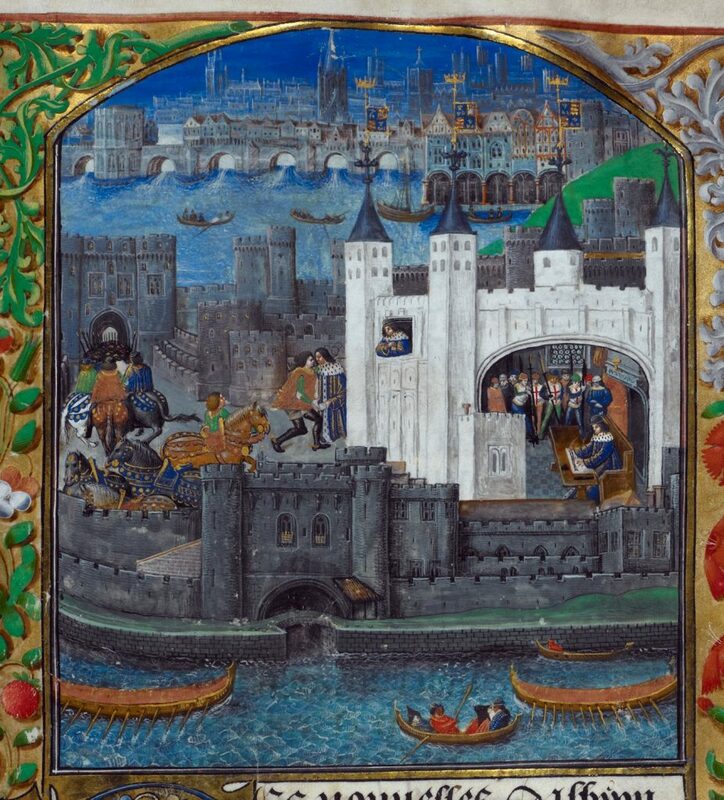 London, as seen in a manuscript of poetry by Charles d’Orléans. Produced in London and Bruges, c. 1475-1483. British Library, Royal MS 16 F II f.73r. So the President has decided to embrace the “medieval” label as something positive for his wall hopes. His critics, meanwhile, are using the same “medieval” label to denigrate the idea. (Durbin’s tweet about the medievalness of the wall continued with an insistence on modernity, asserting that the real solutions were “smart investments in modern screening technology and additional customs personnel.”) In this, they are participating in a different political trend, one that characterizes something as “medieval” in order to emphasize its backwardness or brutality. Scholars have been challenging this characterization for generations, and they have increased the volume of their objections in recent years. They have argued that ISIS is not medieval, Game of Thrones is not medieval, disinterest in education is not medieval. In making such arguments, medievalists are not indulging in a grumpy complaint that their period is being unfairly maligned in popular culture; they are advocating for a better understanding of the past, and they are warning that when we call contemporary violence “medieval,” we excuse ourselves from acknowledging causes in our own era and, sometimes, our own complicity. 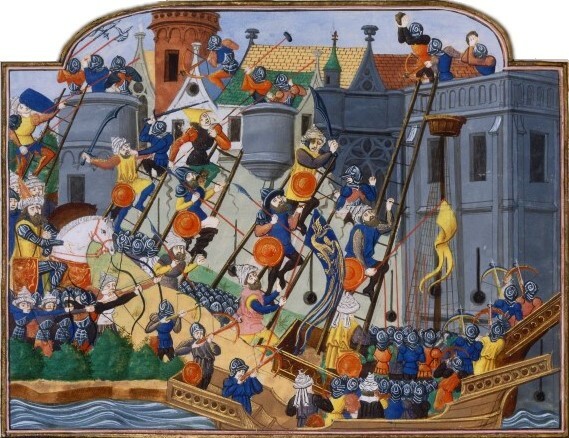 By calling the violence medieval, we are othering it from ourselves. Indeed, in another twist of othering, medievalists have also been grappling with the deeply disturbing tendency of white supremacists and their allies on the far right to usurp medieval imagery, and they have entered into a sometimes heated debate about how academic medievalists should respond. Yet still, in spite of these conversations, the synonymity of “medieval” with “backwards” has proved tenacious in the popular imagination. Another news story making the rounds is showing just how fond we are of the idea of a dark past. Flecks of lapis lazuli were found in the dental calculus of a woman who had been buried in the cemetery of a German religious community in the late 11th or early 12th century. The interdisciplinary team of researchers who studied the case produced a fascinating article that explains their methods and their conclusions, and their discovery provides important evidence about medieval book production. Lapis lazuli, a stone then only available from Afghanistan, was an extremely valuable material. Worth its weight in gold, it was the main ingredient in ultramarine, a brilliant and very stable blue pigment. Only highly skilled illustrators working on the most luxurious artistic productions would have used it. The person buried with flecks of the stone in her teeth, a person whose name we do not know, would have been known in her own time as an accomplished artist. 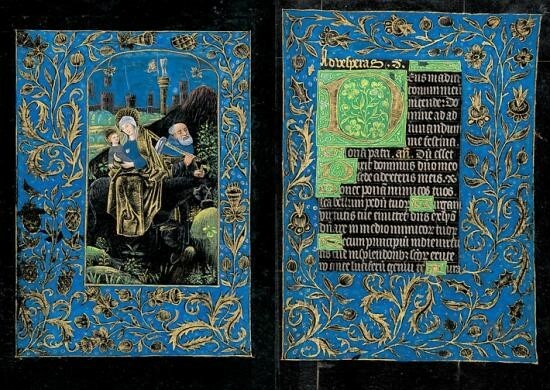 Ultramarine, made from lapis lazuli, used in a Book of Hours, Bruges, c. 1480. Pierpont Morgan Library. MS M.493. Some news reports are correctly reporting that historians are excited to have physical evidence corroborating textual sources for religious women’s book production activities. An As it Happens interview with Alison Beach, one of the historians cited in the article, does an especially good job of contextualizing the discovery. Not all the news reports are telling this as a story of fruitful collaboration between scientists and humanists, however. Some make it sound like the idea of medieval women illustrating manuscripts is totally out of the (non-ultramarine) blue. CNN ran the headline “Rare blue pigment found in medieval woman’s teeth rewrites history.” The Atlantic says in its article that “these embedded blue particles…illuminate a forgotten history of medieval manuscripts: Not just monks made them.” Forgotten by whom? Not by the historians cited in the study. Reading these reports, it’s as if nobody thought that nuns were scribes and illuminators. The study itself, by contrast, carefully situates the findings in current historical understanding. The authors write that there has long been an assumption that monks rather than nuns produced books, but that “recent historical research… has challenged this view, revealing that religious women were not only literate but also prolific producers and consumers of books.” They recognize, in other words, that their discovery adds further evidence to what historians already knew: nuns produced and read beautiful books. As a medievalist, I’m pleased to see medieval walls and medieval scribes deemed newsworthy. I just wish that the underlying assumption for their newsworthiness were not that everything medieval is bad and dark and stupid and therefore totally different from us. No era holds a monopoly on ignorance and cruelty, and to think that these problems have been left behind in the past absolves us of a responsibility to reflect on our own behaviour and recognize the sources of our own prejudice. The false equivalence of “medieval” with “backwards” gives the people of the medieval world too little credit while giving us too much. It didn’t surprise people in the year 1100 that a woman was capable of creating gorgeous books. It surprises us. And I wonder what people in a thousand years would think of that. So let’s adopt a little more humility when we talk about how to help people who are trying to escape desperate conditions. These conditions are not medieval. They are from our world. And it falls to us who are here today to figure out what to do about them. Mairi Cowan is an Associate Professor, Teaching Stream, and Program Director for History at the University of Toronto Mississauga. Students in her courses on premodern World History and medieval European history sometimes hear about walls, scribes, and appearances of medieval history in the news.